Now that we don’t have small, or even medium, children anymore, I don’t have to use laundry pretreatment spay much, so a bottle lasts us a long time. 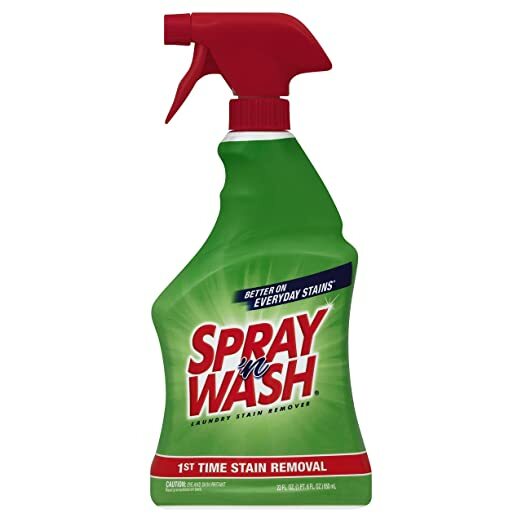 I am old enough to remember when the granddaddy or all treatment sprays, the original product of that sort, came out – good old Spray and Wash. My whole entire married life there has been a lime green bottle of Spray and Wash sitting above my washing machine. Until the last bottle ran out and I went to replace it. I found out that Johnny-come-lately Resolve had been merged with Spray and Wash under the Resolve brand name. While this was not a tragedy in my life or anything, I was curious why such an old and well-known name was put out to pasture. The ad or marketing person who thought up the spray and wash name deserves a place in the advertising hall of fame. How much more simple and clear car a name be? First you spray, they you wash. Name and direction all in one! Well, cooler heads have finally prevailed and guess what is coming back? Yes, the old familiar lime green bottle and name “Spray and Wash.” Apparently, people didn’t want to “resolve” their laundry stains, they wanted to spray them and wash them out! I look forward to the lime green bottle taking its rightful place on the shelf over my washing machine. I best start spilling some ketchup and gravy on my shirts so I can use that Resolve up, fast! FYI – sadly, nothing changed hands to get me to write this post. It is just little old me, making what I hope are humorous, or at least wry, comments about life. I rarely pay attention to the titles on packages. If there’s anything that attracts me to a product besides its quality and price, I would have to say it’s the color of the package and the design of the label. Sometimes I think the advertisers need to talk to people like us who use the products. You were perfectly right about the simplicity of the name and the built in instructions. Who needs change anyway? I just found them back on my grocery store shelves this week and was beyond thrilled. That stuff works amazing and I was so miserable when I ran out because everything else I tried, required multiple washes and tons of scrubbing to get clean.